Sure, the reason why the house got so famous is pretty horrible. But in order to never forget and to ensure that such horrible things will hopefully never happen again, seeing the Anne Frank House from the inside is a must‐do when visiting Amsterdam. There have been several TV and cinema film adaptations about the life of Anne Frank based on her very own diaries. The most recent one is a German cinema feature from 2016, which was partly filmed at the original location of the Anne Frank House in Amsterdam. Amsterdam's most popular sightseeing attraction also appears in another novel and film: In The Fault in Our Stars (2014), the terminally ill American teenagers Hazel and Gus visit the Anne Frank House and share their first kiss here. Read more about visiting the Anne Frank House and tracing the filming locations of The Fault in Our Stars in my post 24 hours in Amsterdam. Another great destination for a film‐inspired trip is the picturesque town of Delft, which still features a wealth of beautifully restored historical buildings. My trip to Delft in September 2017 was a really fun experience of traveling back in time. Not only did I learn all about the famous Delft‐based painter Johannes Vermeer, but also about his unique paintings and the times this film is set in (1665). The "Dutch Mona Lisa" always looks and smiles at you with her eyes, no matter from which side you approach her. If you want to see "the real thing", head to the Mauritshuis Museum in The Hague. You can easily do this on a day trip from Delft. It only takes 30 minutes on the tram or about 5 minutes by train. For 6.50 €, you can get a day ticket for unlimited travel on all trams and busses in Delft and The Hague from Delft’s tourism information point VVV Delft (Kerkstraat 3). Read more about visiting this museum in my Delft film sightseeing post. 4. Visit other world‐class museums such as the Rijksmuseum in Amsterdam! In The Fault in Our Stars, Hazel and Gus can also be seen strolling along the outer façade of the Rijksmuseum in Amsterdam (Museumstraat 1). This museum is a must‐do for any fan of world‐class art. As it's the most famous museum of the Netherlands and one of the most popular ones in Europe, you are guaranteed to see some true masterpieces here! Directly in front of the museum, you can pose for a fun (and free) Amsterdam souvenir photo a with the huge "I amsterdam" letters. Read more about visiting this museum in my post 24 hours in Amsterdam. To get a first overview of Amsterdam, the buzzing capital of the Netherlands, I would recommend a "free" (tip‐based) walking tour by Sandeman's or Freetour. In Delft, you can go on a typically Dutch canal boat tour or do the self‐guided "Vermeer Cube Walk". While tracing the footsteps of the famous artist, you will certainly feel like you've travelled back in time. When in The Hague, take a walking tour with Elswhere Tours and you can be sure to tick off all the highlights of the city in one day. 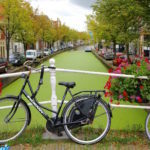 And if you want to explore the Netherlands like a true local, get on the saddle of a typical Dutch bicycle, for example on the Sandeman's City Bike Tour or the Freetour's Alternative Bike Tour in Amsterdam. 6. Relive the tulip craze from Tulip Fever! Alicia Vikander in "Tulip Fever". Photo: Alex Bailey © 2014 The Weinstein Company. Even though the period feature film Tulip Fever (2017) has been exclusively shot in the UK, it provides an amazing "time travel experience" into the so‐called "Dutch Golden Age". 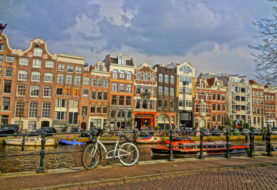 In the 17th century, Amsterdam was one of the wealthiest cities in the world. At one point, everyone became so crazy about the new and exotic tulips that over‐speculation caused one of the first economic stock market crashes in history. For best visibility of Dutch tulips, come in spring (March‐May). The Keukenhof Park (located half‐way between Amsterdam and The Hague) is the most famous place to see them "all at once". 7. See all of the Netherlands in one day! 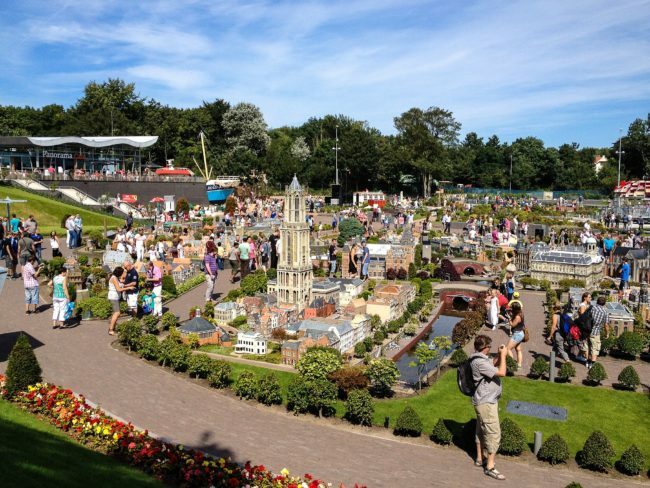 The Madurodam is the place to head to if you want to see everything at once in this small country. Not that you could also reach this goal in a 7‐day tour around this small country, but I guess the Madurodam is definitely quicker… and also a lot of fun. The open‐air museum and miniature park is located in The Hague's seaside district Scheveningen. 8. 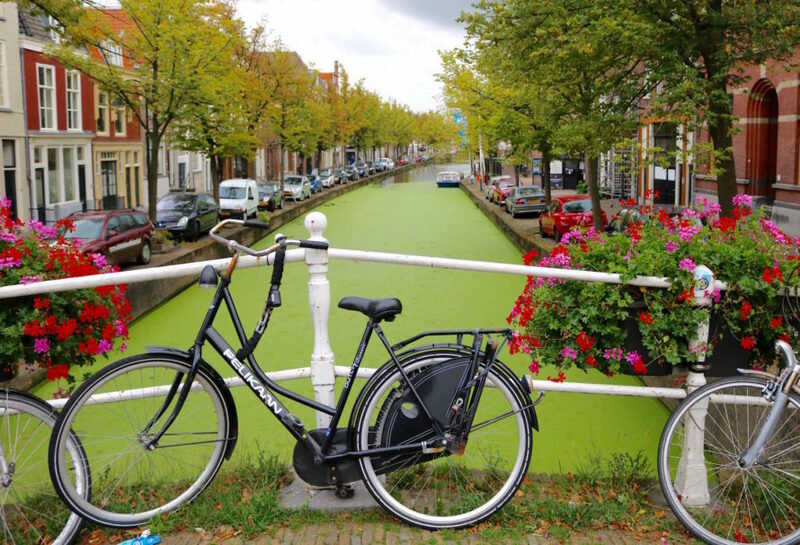 Sit back and relax on a canal boat tour in Delft! The most Dutch thing you can do (apart from cycling of course) is to take in the sights of a Dutch town via a canal boat tour. My recommendation: The “Delft City Tour” includes a 1 hour boat ride tour on the canal with commentary by a multilingual tour guide as well as a 1 hour walking tour around the city and even a little present at the end! 9. Try some (funny flavoured) Dutch cheese! Typically Dutch foods to try include the yummy French Fries (that typically come in a paper bag with mayonnaise and ketchup), Dutch beer, and of course cheese! If you travel to Gouda, you can be sure to find a lot of cheesy tourist attractions (no pun intended!). After all, Gouda's cheese of the same name is world‐famous. Attractions to check out include the Goudse Waag cheese and craftwork museum or the famous cheese market during spring and summer. At the Cheese Museum in Amsterdam, you can eat your way through samples of all kinds of cheese flavours – including such exotic combinations as Pesto Cheese Tricolore! Read more about visiting Amsterdam's Cheese Museum in my post 24 hours in Amsterdam. 10. Relax at the beach… you've earned it! 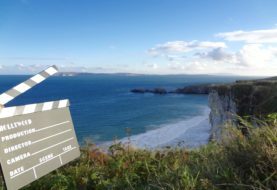 The two young lovers in Tulip Fever (2017) flee to the beach near Amsterdam and so can you, too: After all, the next lovely beach is never far away in a country as small as the Netherlands. Read more in my Netherlands Travel Guide for Film Fans.